The bitter taste of defeat again। Another learning curve yet again. After the times exhilarating feeling and at other times the trauma of setbacks during the grueling campaign, the loss-on the whole- has made me richer in experience with life. I got affection and votes from every section of the society. From twenty-six thousand odd votes as independent candidate five years ago, I have now polled more than 1.51 lac votes. The loss as an independent pressed home the necessity of party based electoral politics and the real-polity of vote banks. I must give credit to Sadhu Yadav for ruining my party : he garnered a substantial chunk of RJD votes- he polled about 71 thousand votes, almost twice the margin that I lost by.My coalition’s division with the Congress proved to be my nemesis. There was obviously a Nitish wave sweeping Bihar but that played a little, if at all any, role in my debacle.I need now to sit back and rethink about my intervention. But I am happy to have been working in Champaran - my home and constituency- since the past five years, especially with my efforts to develop industry and agriculture here. The construction of my sugar mill is going on at full pace and next year we’ll begin production. That indeed will be a sugar coating to wipe out the sense of loss that one feels today.I am happy that I followed my conscience and followed the secular path. A loss does taste bitter. But, in my defeat too, there is no bitterness with anyone. Only the lingering aftertaste of peoples’ love and affection that I have been getting all through. It was a good feeling to wish best of luck to Sadhu, Sanjay and Ramashray Babu of CPM before counting commenced this morning. And, yes, I was still there to congratulate Dr Sanjay Jaiswal on victory at the end of counting. I wish our new MP the very best in his new innings as our man in parliament. You are right sir, but we are (who like to see movies by your name i.e. 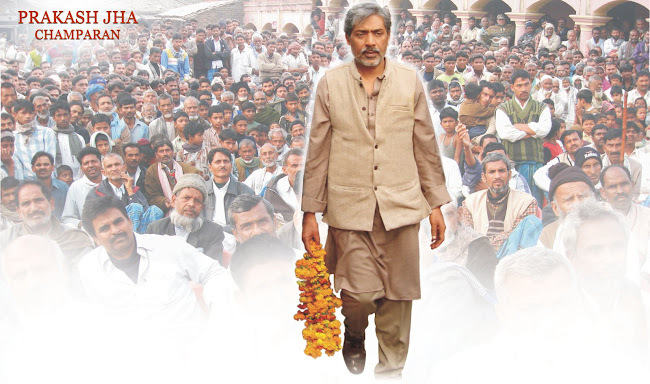 directed by Prakash Jha and who are always waiting for your films) feeling that we are defeated. I was confident about your victory (doing great through Punarwaas, reasons nice thoughtful human being, popular, and also have enough money). Hoping we would understand Rajniti more clearly from your Rajniti Movie. Yes Indeed You are NOT defeated. Jab tak politics main aise log (S.Y) hoge jin ko apna sochna hai na ki Champaran ki janta ka .isliye aap jaise ache ka hona anivariye hai. Aaj nahin to kal Chamaran ki janta ko mehsus hoga ki apka unke liye politics mian hona kitna jaroori hai.
" VOH SUBHA KABHI TO AIYGI"
we are waiting for Rajneeti, Sir. Being a true example of national integration - born and brought up in North-East, studied in south, married in West and hail from north (a Jha from Deoghar, now in Jharkhand), I have seen how different parts of India behaves with various people. There have been many successful people from Bihar/Jharkhand but very few who have given back and worked for the cause for this state. I am glad you have taken up the cause. Your thoughts expressed here are so humble, you can never be defeated!!! It has been my dream to meet you in person. I wish someday I can, when you are in Mumbai. Liked your spirit. Don't buckle...under this flop....hit back with a suoer-hit next time...Rajneeti is so much like films...you would now know first hand in both worlds. FOR A COMMONER ITS NOT ONLY A SUGAR MILL OR INDUSTRY REQUIRED. IT IS ALSO TO BE GAGED THAT THE BASIC INFRASTURCTURE IS IN RIGHT PLACE VIZ. ; EDUCATION, ROADS, POWER, DRINKING WATER AS THESE FORM THE NERVOUS SYSTEM FOR ANY DEVELOEPD BLOCK OR CITY OR COUNTRY. NEVERTHELESS WE KNOW YOU ARE NOT TRYING TO LEAVE ANY LEAF UNTURNED, I SALUTE TO YOUR COMMITMENT. YOU BEING A HIGH CALIBER PERSONALITY WHOSE THOUGHT PROCESS WORKS WHEN MAKING A MEANINGFUL MOVIE BUT AT THE SAME TIMES IN THE REAL RAJINITI IT DOESN'T WORKED HAVE YOU GIVEN ANY THOUGHT INTO THIS??? WHAT I ANALYSED AS A COMMONER THAT YOU CHOSE A WRONG PARTY TO REPRESENT IN THE LAST ELECTION WHOSE IMPACT EATEN YOUR GOOD WORK AND POPULARITY. SORRY FOR BEING A CRITIC EVEN I AM AN AVID FAN OF YOURS WHO ALWAYS BE ON A LOOKOUT FOR A GOOD FILM FROM YOU. Sir, I'm your big fan & since very long I'm searching for the serial directed by you "mungerilal ke haseen sapne". Could you please let me know how I can access that. It is late to talk about elections now ,but as a diehard Bihari ,i was hoping that as a new wave of awareness is sweeping Bihar ,you stood a good chance to win . Never mind Press On Regardless . There is always a sunrise . There were a glaxy of experts from Police to speak about the problems , the nixus between Police and politician ,the ineffectiveness of the IAS etc . Iwas reminded of the Two Classic films made by u GANGAJAL and APHARAN . oNE OF aspect that got high lighted was the plight of the poor Policeman , who is at the lowest level of delievery .His condition is most appauling . You have done a lot of research on Police . I would request u to think about them and see if u can produce a film on them too. I belong to champaran and I too am little feeling defeated when u lost the election once again. But, what to say, there is one more reason that u were defeated. u elected to be in a party whose leaders are doing just cast politics. Who beleives in them that also matters. Whatever vote U got, most of those was your personal votes and I think, if you would have come without any banner, U must have got similar counts. one more thing, I too have a little political test and have seen, politics in Bihar specially is not the developemt based and is not for fare people.There are some people who have experience and they don`t want to loose their position. It is difficult to handle them. I wish a successful career in politics. And yes, I wish U are going to give an industrial test to West champaran. Sir, I am an Engg. Graduate 1975 and voluntarily retired Exec. Engr. (MPSEB,Jabalpur)belongs to a farmer & businessmen class family. I have a wonderful idea on the basis of my experience/facts centered on which a fantastic story with a nice message can be formed and picturised. I am confident, if a person like you take interest on this can make halchal in the minds of people and create wealth & fame for us. Sir its like a very fruitful seed I am having and you are like a Gardener who have fertile land and all other requisites to make this seed in a fruitful tree. Kindly suggest me how the idea can be executed and oblige me to give an opportunity to discuss the same with you for few of your valuable minutes. Thanking you. Gor lage chi, Jhaji! I'm writing from Southern California. I'm a lawyer fighting for the disenfranchised in Los Angeles County, and I am finishing my first documentary on Asians in US Politics. Specifically, the film looks back at Dalip Singh Saund, the first Asian/Indian to serve in the United States House of Representatives over 50 years ago. My parents are from Darbhanga district, and in the near future my father, brother and I will begin working on ways to help the ancestral home. apki film aur aap jo film banate hai woh kafi achhe hote hai infact aise film bahot kam log banete hai yaha kafi log hai they sell fantasy also and it become hit.Now i see good films which get very clear with promo only like lot of film including yours also i think marketing is hardly required for such film.i have one question to you as like you i also grown up in bihar only and living in otther state for last 10 years things are very much same here other than metro's.i feel sad that you only show bihar in wrong way with your film like mritudand ,gangajal,apaharan...there are lot of iisue in other part of india like bal vivav .parents dont wantv girl child ,politician have affair politician have milolion doller in there account. har state me hato hai as a visionary you know that there is lot of crime and fake politician and people there in india why don't you take issue of other place or there is lot of good thing about bihar like there is hardly any good college in bihar still weclear lot of national exams ips ifs ias engineers software engineers research professionals.there are lot of peoplle who do small things to survive and make livings. Iam nothing infront of you.But say somthing if you allow me.Please come back and protect our champaran.Because you are the person who diserves all of that quallities which should be in a leader. Dear sir this raushan jha native of Banu chapra Bettiah,West Champaran.sir one of my collegues has written a script and he wanted you to make a film on his script.so sir kindly pay some attention regarding this and help me.plz reply sir.thanking you your well wishers and fan. I hope your film Rajneeti is not based on lies as we are shown in media. As a Indian i am ashamed such people with criminal and being a ex-KGB is ruling our country and yet millions dont know it. I sincerely hope such a great person as you doesnt do the same thing. RAAJNEETI HAS ALREADY CREATED HISTORY. ITS UNDOUBTEDLY THE MOST AWAITED FILM OF THE YEAR. BUT WE WILL BE HIGHLY OBLIGED IF WE COULD GET "AN UNCENSORED VERSION" OF RAAJNEETI VCD/DVD WHENEVER ITS DVD RELEASES. BELEAVE ME SIR IT WILL ROCK. HOPE YOU HEAR OUR PLEA. Namaskar. We are really proud that you being an Indian Idol from West Champaran. I really appreciate your work and am a big fan of yours. Regarding Politics, It is something different where the result is not in your hand. If you ask people who is the best candidate they will say "X" and if u ask to whom you are going to vote then they say, we will think. In your case, As I belong to the same area, You were defeted only because you selected a party LJP/RJD which can never win from Bettiah constituency. leaving an exception (Mr. Raghunath Jha once) people always have been supporting BJP and the alliance. But, this is not the end. You got support from more than 1.5 lakhs people. You should be proud of that and people will always support you. This is Anil from B'lore and I feel proud as a Bihari when I watch your movie with concept and send a message from the movie and hope Aarakshan will make another history after Rajniti and my best wishes for the team. So kindly make a movie on Scam or Scandal how the people looting our nation and misuses our tax for few people. Beginners will find the facilities to learn to dive before they head out, meaning nobody has an excuse to ignore this amazing part of the Cuban experience. and it was hailed as being one of 5 of Wired Magazine's "must have i - Pad apps". Now in history we're at around 9% of the U.S. citizenry being Diabetic in some fashion. diabetes without medication must be used fast. stumbleupon every day. It's always exciting to read through articles from other authors and practice a little something from other sites.